Strength training is probably the most important exercise component of your antiaging program, because it is necessary to build and maintain the lean body mass and bone density that will ensure your continued health and longevity. Resistance training consists of various exercises done with equipment that provides weight or other resistive force and enables you to work your muscles progressively harder as your strength increases. The equipment can include a wide variety of devices and implements including barbells, dumbbells, exercise machines, elastic cables, and kettlebells. A training program designed to result in increased strength and lean body mass should be both brief and intense. Workout should be preceded by some kind of warm-up and not go over one hour in length. Warmups are needed to raise body temperature and prevent injury to joints and muscles. You can even use a hot shower to do this during the colder months and it works quite well. Static stretching of the muscles that will help prevent injury. The mark of a good fitness weight training program is that it allows you to make steady progress without burning yourself out. That is the essence of effective strength training. I will give a general overview of what strength training is and how it should be integrated into your antiaging efforts. Ten to fifteen minutes of light cardiovascular exercise is a good general warmup. Some feel that cardiovascular exercise is best done after your resistance training exercise, but for purposes of general fitness I don’t think it is critical. a repetition refers to the number of times you repeat an exercise. A set refers to a number of repetitions performed before stopping and resting. For example, three sets of eight repetitions means that you do eight repetitions with a particular weight, then rest anywhere from thirty seconds to a minute or more, then perform another eight repetitions, until you have done this three times. Strength training is organized this way to regulate volume of work performed and ensure proper rest intervals. In resistance training exercise, the amount of sets and repetitions performed for strength training is an individual thing and dependent on your work capacity. If you are not sure how much to do, always be conservative to avoid injury and overtraining. You can always ramp things up in future workouts if you feel you underestimated your ability. 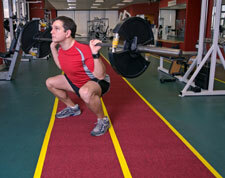 Compound exercises involve groups of muscles rather than isolating one muscle. 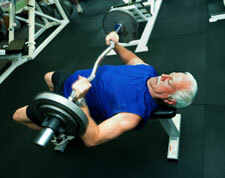 Bench presses, squats (deep knee bend), standing press, pull up, ect., are examples of compound exercises . Exercises involving extending arms or legs in a single joint movement are called isolation exercises. Compound exercises spread the stress of the exercise over more muscles, and cause the entire body to work harder to do the exercise. When using compound exercise you do more total work in the same amount of time. This is called “training efficiency.” Since fitness weight training is what we are doing, it makes more sense to use this method rather than isolation exercise. How Heavy Should you Go? The amount of weight used in resistance training exercise should be enough to allow you to complete each set without strain. If you are doing three sets, you may choose to use a progressively higher weight on each set as a warm up strategy, so that your are getting the highest level of resistance on your third and final set. The ways that you can organize fitness weight training are endless. If you wish to contact me I can write a training program for you. Or if you choose to formulate your own program, the links provided on this page will take you to more detailed information on how to incorporate strength training into your antiaging system.